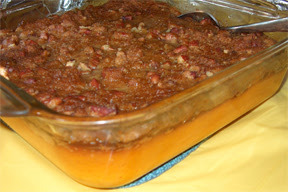 One of our favorite holiday dishes is Southern Sweet Potato Casserole. This sinful dish would work just fine on the dessert table, but we eat it as a side. Sweet Potato Bake is delicious with turkey or ham. Not only is the casserole rich and sweet, it adds some color to the dinner table or at a pot lot feast. This is one of my mom’s specialty recipes, and folks are always asking her how to make this dish. Boil sweet potatoes until they are soft when stuck with a fork. Let cool a bit. Peel. The peeling basically falls right off. Mash sweet potatoes until nice and creamy. Add the casserole ingredients to the mashed sweet potatoes. The order isn’t critical. It does help to let the butter get pretty soft or even to melt the butter. Mix everything in well. Spray a little Pam or very lightly grease a casserole in the 9 x 9 size range. Pour the sweet potato mixture in and smooth even. Mix the topping in a small bowl. If you’re in a hurry, you can just put the topping on in the order listed. Bake casserole for 15 minutes at 450 degrees. This crisps up the topping and has the filling piping hot. Sweet Potato Casserole can be put together the night before and then baked right before the meal. Just tuck it in the refrigerator and pull it out the next day. Allow a little more cooking time if the casserole is fully chilled. This casserole also warms up well in the microwave. You probably won’t have leftovers, but if you do, you’ll enjoy the sweet potatoes re-heated too.